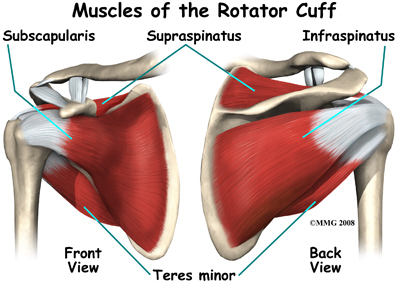 Rotator Cuff it’s a group of 4 muscles that connects to the humerus (upper arm) & scapula (shoulder blade), working together in stabilizing & rotating the shoulder. Each of these muscles have an origin point at the scapula and an insertion point on the humerus. Limitations in different movements suggest different problems. If a doctor/physiotherapist can move your arm fully, but you can’t (because of weakness), a rotator cuff tear is possible. Painful Arc test: Pain that is elicited when raising the arm beyond 90 degrees as the arm moves away from the body and toward the side. 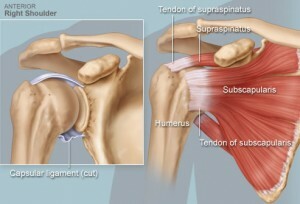 This can indicate any one of several different problems with the shoulder. Physical therapy: Various exercises can improve flexibility and strength of the other muscles in the rotator cuff. This increased strength can help compensate for a rotator cuff problem. Occupational therapy: Similar to physical therapy, occupational therapy for rotator cuff injuries focuses on daily tasks that require shoulder movements. If you feel like you are having shoulder movement limitation and pain, get in touch with a physiotherapist and have checked out, as it could create a great deal of problems in time, including “frozen shoulder”, neck pain, front and back of upper arm nagging and disturbed sleeping patterns.